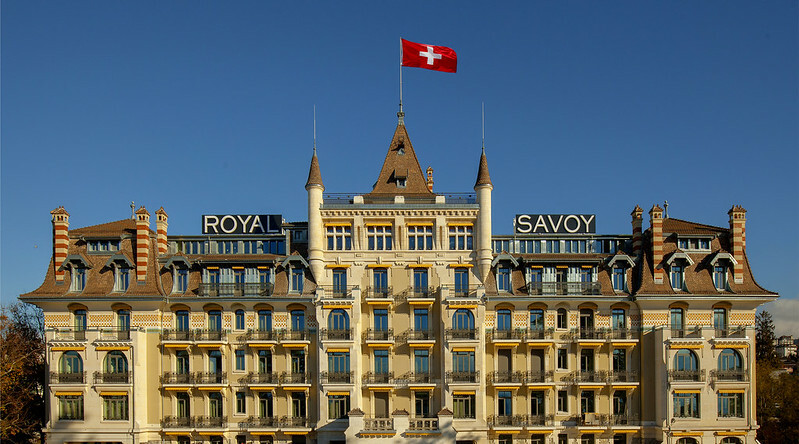 After a closure of six years and a refurbishment taking from 2009 to 2015 and costing CHF100 million, this hotel reopened in November 2015. Now owned by Katara Hospitality it is part of the Burgenstock Selection; three hotels, all in Switzerland, all with history and all now renovated with seemingly no expense spared. Close to the centre of Lausanne, between Ouchy and the main train station. It is not on the lake side like the Beau Rivage Palace and the Lausanne Palace, but it is convenient for the town, and across the road is the excellent new metro system accessed from the Delices station (line M2). It is only two stops to the main train station from where you can catch the train to Geneva airport. If you are driving, there is a car park of 153 spaces on three levels. The stunning Art Nouveau and Neo Baroque exterior of the hotel reflects both its origin (it opened in 1909) and the wealth of the guests it hoped to attract as they travelled along the north side of the lake using the Simplon line. The original three architects – Charles Mauerhofer, Adrian van Dorsser and Charles-François Bonjour created a beautiful hotel which incorporated architectural innovations which, ironically, caused untold problems when the hotel was refurbished – notably the suspended reinforced concrete floors which were only two to three centimetres thick in places. In the lobby you can see geometric stained glass windows created by Lausanne-based glassmaker Drevars. The hotel’s 196 rooms and suites are split between the historic hotel (101 rooms and suites) and a newly built Garden Wing (95 rooms and suites) accessed down the hill via a glass corridor. Rooms range from Deluxe (80 percent of the room total) which are 30m2, in both the historic building and the Garden Wing, and which have either city or lake views, up to extremely large suites, almost residential in size. In contrast to the exterior of the hotel, all the rooms are very modern with polished wooden floors, rugs with a geometric pattern along with floral bed throws, flat screen TVs, and contemporary lighting (which thankfully can all be turned off via a master switch by the side of the bed). My Premium room (36m2) had a good size work desk with power points for UK, US and EU plugs (and Swiss), free high speed wifi and then a comfortable arm chair with foot stool by the window which was very comfortable and a great place just to relax and read. The bathroom had lots of mirrors and good quality fittings including marble, but were modern and equipped with rain showers (and some with Japanese bathtubs). Wifi is complimentary, and there are Nespresso coffee machines and a free non-alcoholic mini bar (alcohol is paid-for). The hotel’s main dining room for breakfast, lunch and dinner is La Brasserie du Royal under chef Marc Haeberlin, owner of Auberge de l’Ill and of Brasserie des Haras in Strasbourg. The entrance corridor to this restaurant offers a showcase of local wines, cheeses and cuts of ageing meat, while a mosaic floor lists the eight Protected Designation of Origin wines in the Canton de Vaud. The restaurant has a capacity of 120 covers, though the historic nature of the space means it is split into four rooms – the Great Room, the Buffet, the Alcove and the Veranda – and also has a garden terrace which can seat a further 40. The food in the evening was excellent, the breakfast in the morning less impressive because the hotel was very busy with UN delegations meeting at the hotel and there was very little food left when I came down at 0830, and I didn’t have time to wait for fresh supplies to be brought. There is also a Lobby Lounge (60 indoors and 19 outdoors) and bar with a double height ceiling and impressive pictures and stained glass windows alongside historic paintings of the areas around Lausanne. On the other side of the corridor is an excellent cigar lounge (all the Burgenstock Selection hotels have them, and they are all wonderfully relaxing places for cigar smokers). Finally, on the top floor, the hotel’s Sky Lounge has stunning views of Lausanne and the lake, good for an evening drink during the warmer months. The hotel has 1,200m2 of meeting & event venues, including five conference rooms, a 269 m2 Royal Salon, a small 106 m2 function room (Petit Salon) and the largest of Lausanne’s ballrooms (574 m2), which can be split into three separate rooms. The new Garden Wing has made room for a huge spa – 1,500 m2 including both an indoor and an outdoor swimming pool, a vitality pool, sauna and steam rooms, eight treatment rooms, as well as a private Ladies-only area, two Spas for private use and a 24-hour gym, perfect for travellers with jet lag. Spa and well-being Le Spa du Royal: 1,500 m2, connecting indoors and outdoors swimming pools, women-only area, 2 private Spas, latest-technology gym, care treatments, massages. This is an excellent renovation of a gorgeous-looking hotel, and one where it would be a pleasure to be holed up for a meeting for several days – just make sure to explore Lausanne while you are there. Take a look at the photos from the hotel below on the slideshow….